I won a Moblie! And a Bessie! Imagine my Surprise today when I won the Moblie Award from the guys at Utterz. It included a Bessie stuffed animal and $250.00. That is going to come in handy when I get home to get a nice anniversary gift for Allison. Our two year anniversary is on Monday. I am going to write up a fantastic blog post about this amazing service. It truly is one of the best out there. Congratulations! What a nice surprise for you. And Happy Anniversary too. Have a great weekend! Congratulations on winning and on your anniversary :)! Thanks Elizabeth, She’s getting a really nice item for the anniversary. And we’re hitting a really nice place for dinner. Memere is going to take care of her that night. Thanks Webduck. I appreciate the comments and the visit please come back whenever. Thank you very much Nicole. I appreciate that. And thanks for the visit to my blog. Congratulations on both winning the award and your anniversary. 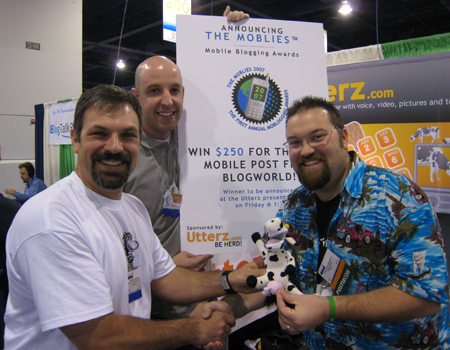 I can see Bessie in the photo, but not the Mobile Award, but it sounds very cool. Bessie is the award I think. She is awesome!